There’s a common misconception that studying abroad is only for college students, like only they can venture into the world to be inspired while atop the ancient city of Machu Picchu in Peru. Sending a minor abroad may seem early to some, but there are in fact many benefits to having kids set out on a trip before they get to college—thanks to their malleable and eager minds, ready to soak in new knowledge and experiences. Whether your student is traveling on their own or with your family, here are some reasons why you should be packing their bags long before they reach university level. Traveling abroad as a 12-year-old is a vastly different experience than that of an 18-year-old. Primary or secondary students will have less pressure to maintain the academic obligations of a structured university program. With this potentially extra time, younger students have more opportunities to venture out of the classroom and explore new environments. Being introduced to the international scene at a younger age also allows students to experience the niches of different cultures, which college students might often miss. For instance, when international students travel to the United States, they can attend football games, school dances, and even talent shows to get a preview of how kids here grow up. At iD Tech’s summer programs, students get to experience American camp culture, including everything from dressing up as Superman for superhero day to getting involved in a game of capture the flag. Traveling as a primary or secondary student is a lot more affordable, because younger adventurers have less personal financial obligations. College students have more to juggle when abroad - from rent to loan payments to groceries - resulting in a much higher cost of living. There are also many different program options available to younger students. For instance, many high school students travel abroad during the summer, with programs of various durations. Parents who would rather their children only spend a week abroad (rather than the entire summer or large chunk of the summer) have the option to do so! Studies have shown that younger students find it easier to learn a second language compared to their adult counterparts. Reason being, children have less developed habits of pronunciation and grammar, so it’s easier for them to adopt new habits. Being immersed in a different country provides younger students with less competing distractions, as well as greater social pressures to adapt to the language they’re hearing around them. Further studies have shown students who pick up a second language gain more grey matter in their brains, which links to higher intelligence. Studying abroad while young allows students to take advantage of what researchers have deemed the “critical period” for kids to learn a second language. While college may still be a ways away for some primary students, it’s never too early to start prepping for college and developing skills that might benefit them in the future. Creating the pathway for your student is essential for them to be prepared not only for university, but also for future careers. Research conducted by the American Institute of Foreign Study showed 34% of study abroad students claimed that studying abroad helped them when selecting their career field. Potential reasons why? Being abroad exposes students to new ideas and experiences that they may not have at home. They’re able to get a head start on building their portfolios and developing career interests—which are benefits your student can reap long after they return from their time abroad. 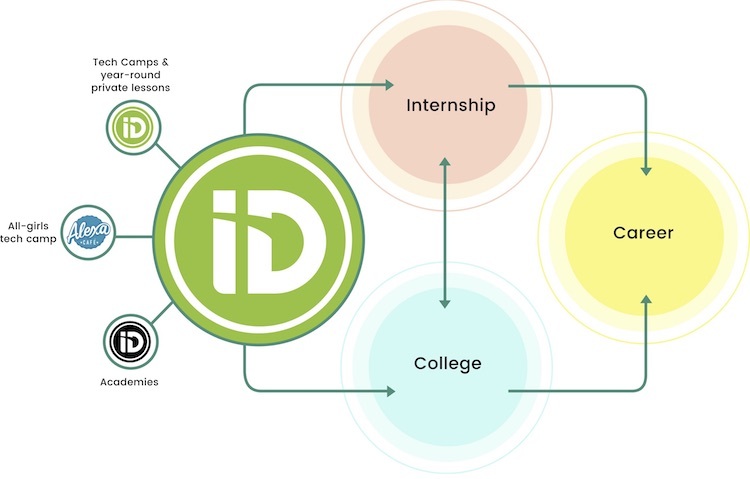 At iD Tech, our students aren’t just attending for a week or two of summer fun, but are developing their tech skills through the iD Tech Pathway at the same time. One-week student experiences at our tech camps often progress to two-week sessions at our Academies, as students gain mastery in their genre of study. Our mission is not only to empassion students about technology, but also to help them shape the future as the next generation of coders, game developers, robotics engineers, and designers. Now it’s up to you to help get them started, and to assist those bright minds in getting atop those Peruvian mountains, so they too can experience some of the greatest wonders of the world! Stay tuned for our next post to help you decide on which study abroad program your student should embark!